Some western corn rootworms, like this gravid (egg-carrying) female, survive on soybean leaves long enough to lay their eggs in soybean fields. When the eggs hatch, the larvae feed on corn roots if the same fields are planted in corn the following year. CHAMPAIGN, lll. - A new study answers a question that has baffled researchers for more than 15 years: How does the western corn rootworm - an insect that thrives on corn but dies on soybeans - persist in fields that alternate between corn and soybeans? The answer, researchers say, has to do with enzyme production in the rootworm gut. 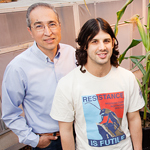 University of Illinois crop sciences professor Manfredo Seufferheld, left, graduate student Matias Curzi, Illinois Natural History Survey insect behaviorist Joseph Spencer and their colleague Jorge Zavala (not pictured) found that rotation-resistant rootworms have more protein-degrading enzymes in their guts and survive longer on a diet of soybean leaves than other western corn rootworms. Their findings are described in a paper in Ecology and Evolution. Crop rotation declined in the middle of the 20th century as the use of insecticides and fertilizers expanded in the U.S. Then in the 1950s and '60s, when some insecticides began to fail, growers again turned to crop rotation to kill off the rootworms that fed on corn. The method was effective for decades, but by 1995 some growers started seeing rootworm damage even in rotated fields. Today rotation-resistant rootworms are widespread in the Midwest cornbelt, where corn and soybeans dominate the landscape. Crop rotation in East Central Illinois imposed intense selection pressure on rootworms, leading to the emergence of resistant insects said University of Illinois crop sciences professor Manfredo Seufferheld, who led the new study. "In Champaign County, Illinois, where you see a lot of rotation-resistant rootworms, 84 percent of the total land area is corn or soybeans," he said. "But as you go to Missouri, which has only wild-type (non-resistant) rootworms, almost 50 percent of the land area is not corn or soy." Rootworm larvae live on the roots of corn plants, so it makes no sense for a rootworm beetle to deposit its eggs in a soybean field, Seufferheld said. "But with crop rotation, we're making special conditions that allow those crazy insects to survive." Previous studies focused primarily on the behavioral changes that led rootworm beetles into soybean fields, but Seufferheld and his colleagues focused instead on the rootworm gut. Their focus was prompted by observations made by Jorge Zavala, a former postdoctoral researcher at Illinois and a co-author of the study. Zavala, now a visiting scholar at Illinois from the University of Buenos Aires, knew from previous research that levels of protein-degrading enzymes in the insect gut, called proteinases, rise and fall in response to chemical defenses in soybean leaves. He saw that rotation-resistant rootworms survived longer on soybeans and inflicted more damage on soybean leaves than their non-resistant peers. He also detected differences in levels of proteinases in rotation-resistant and non-resistant (wild-type) rootworms. The new study tested these results in a broad sample of western corn rootworms from Illinois, Iowa, and MissouriNebraska. 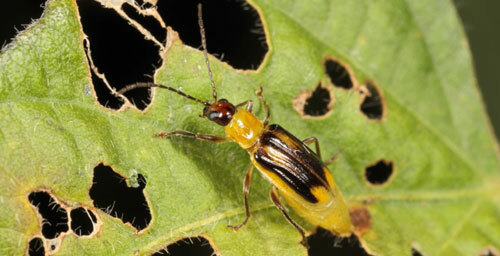 "We indeed found that the rotation-resistant rootworms could eat more foliage than the wild type," Seufferheld said. "They are also able to survive a little longer on the soybean than the wild-type rootworms." When insects feed on them, soybeans ramp up production of proteinase inhibitors to combat the insects' ability to digest proteins in their leaves. The researchers hypothesized that the rotation-resistant rootworms had evolved the ability to compete a little longer in this chemical warfare with the soybeans. Tests confirmed that rotation-resistant rootworms had higher levels of a special class of proteinases than wild-type rootworms to begin with, and that they increased production of one of these proteinases, Cathepsin-L, in response to soybean defenses. The wild-type rootworms increased levels of another proteinase, Cathepsin-B, when feeding on soybeans, the researchers found. But this enzyme appears to be ineffective against the plant's defenses. This difference allows the rotation-resistant beetles to survive on soybeans for two or three days - just long enough, the researchers said, for some of them to lay their eggs in bean fields. In spring, when the same fields are planted in corn, the rootworm larvae emerge to feed on corn roots. Illinois insect behaviorist and co-author Joseph Spencer of the Illinois Natural History Survey, part of the U. of I. Prairie Research Institute, said that before this study, researchers studying rotation resistance were looking at the insects and insect behavior in isolation, thus missing their interaction with plants as a potential clue to the problem. "You have to include the soybean in the equation," Spencer said. "It is not a passive player. The beetle has changed its behavior but what facilitates this change in behavior is the change in expression of these digestive proteinases. That allows them to stay in the soybeans longer. We had ignored this aspect of the biology." The study team also included Matias Curzi, of the U. of I., who earned his master's of science in Seufferheld's laboratory and now is working at Pioneer Argentina. Funding for this work was provided by the U.S. Department of Agriculture's National Institute of Food and Agriculture. Editor's note: To reach Manfredo Seufferheld, call 217-333-6505; email seufferh@illinois.edu. To reach Jorge Zavala, call 217-333-6505; email jzavala@illinois.edu. To reach Joseph Spencer, call 217-244-6851; email spencer1@illinois.edu. The paper, “Abnormally high digestive enzyme activity and gene expression explain the contemporary evolution of a Diabrotica biotype able to feed on soybeans,” is available online.